Last summer, the question on filmgoers’ lips was, “who watches the watchmen?” This summer, you get to watch the “watchers,” when SECRETS OF THE TRIBE reveals the inner dynamics of a close-knit and guarded people. Director Jose Padilha (his debut was BUS 174) turns his cameras on the tribe of anthropologists who in turn turned their cameras on the Yanomami, an Amazonian tribe on the border between Venezuela and Brazil. The Yanomami had very little contact with the outside world until the 1960s, and were considered a “gold mine” by cultural anthropologists who rushed to study the so-called “virgin” culture. 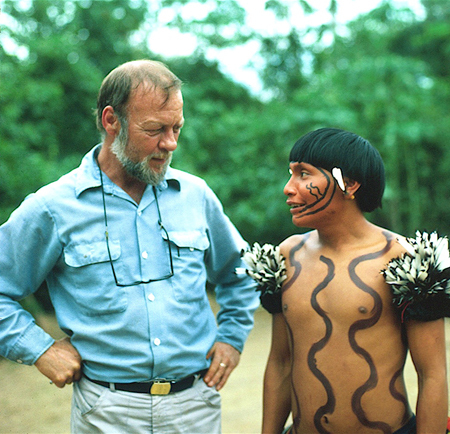 Careers were made based on fieldwork in Yanomami villages: the scientists produced numerous books, articles, and ethnographic films. They also developed bitter rivalries. It is a human foible that our most acrimonious quarrels are always with those to whom we are closest. Padilha doesn’t need to level accusations at his interview subjects; the anthropologists willingly point fingers at each other for him. The film does an excellent job of revealing the passions that drive scientists to their work. Sometimes it is a passion to learn and share the knowledge; other times it is the very human passion to beat a competitor to the finish line. While it is clear that the main characters have let their differences of opinion grow into outright resentment, almost to the point of appearing pathetic in their outrage, Padilha films them with at least a little bit of compassion. For their sins are all too human, and shared by us all: pride, lust, and envy. Daniel Fienberg at HitFix has written a thoughtful and thorough review of SECRETS OF THE TRIBE. SECRETS OF THE TRIBE screens Tue, June 22, at 1:45pm and on Sat, June 26, at 3:30pm. Buy your tickets now, because they are going fast. Matthew Radcliff is a member of the SilverDocs Screening Committee and the organizer of the WIFV Documentary Roundtable.